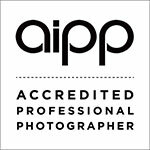 I’m proud to be an accredited professional photographer with the Australian Institute of AIPP (Professional Photography) and I was recently awarded my Associateship within the organisation. The AIPP holds high standards and also fosters personal and professional growth in its members through its continuing professional development program. Look for the AIPP logo when choosing your photographer.